One of the first games we played was called "STOP". 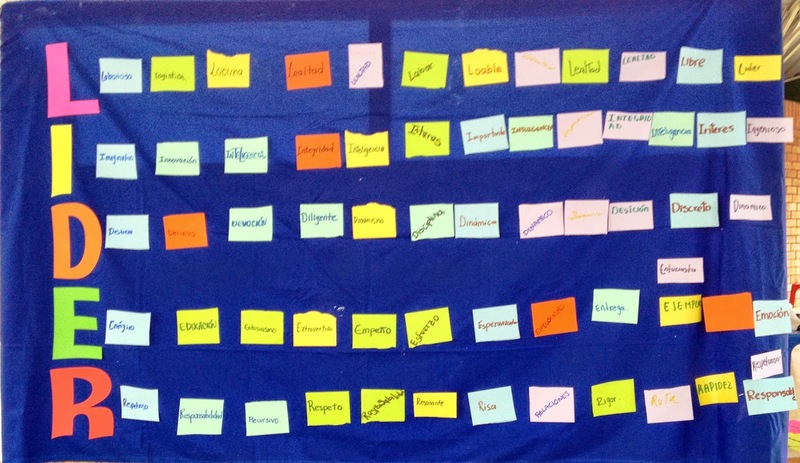 A word game with one of the categories about the characteristics of a leader (LIDER). Here the participants are sharing their ides of the characteristics of a leader (corresponding with each letter of leader = lider in Spanish). Here is a close up of the 'tela azul' (the blue cloth you will see in many of the pictures....aka the magic cloth). With a little bit of non-permanent spay glue on the cloth, any kind of paper basically turns into a post-it note! Here is a close up of the words people wrote, they were great, words like: loyal, responsible, fun, integrity, diligent, etc. It was a great exercise. This is a picture of Zulma (who I accompany in many projects) teaching about the different things we can from Jesus and his leadership styles - having a clear focus/objective and having a clear methodology (which may change depending of the group you are working with). One of the activities I lead was for the part intrapersonal. There were four groups, and every group was given one piece of a puzzle, the groups had to race to find the rest of the pieces of their puzzle hidden anywhere outside of the retreat center where we were. This also became one of the jokes of the weekend because one of the pieces of one of the puzzles blew away...oops! After this activity every person was given a piece of paper with some thought points to journal about. During the sharing time after I was shocked at how honest people were about their fears of leadership, their dreams for the church, or their struggles with their own congregations. Very powerful time! Another activity using the magic cloth. This is Henry sharing what his group discussed during the session about one to one leadership. We had each group look at different teacher/student relationships in the Bible and share what they learned. Legos, yes like the kid toys. 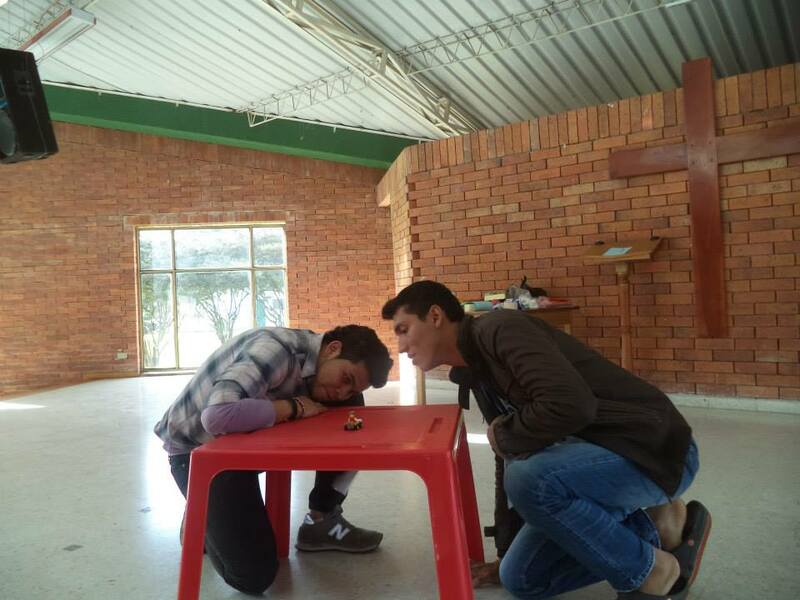 This was an activity in leading small groups. Every group had one leader. That person was the only person in the group who could look at the figure all put together. The leader had to try to explain to his/her group what the figure they were building should look like; the catch, they couldn't touch any of the pieces. Here are Mauricio and Cristian looking at the little truck so they can report their findings back to their groups. This proved to be a very difficult activity with only one of the four groups getting the figure correct. Here is another one of the groups working (this was the winning group)! It was a very fun activity with a lot of great processing after about what type of communication worked and what didn't work as well. Enjoying a campfire, with songs and marshmallows! This truly was an incredible weekend. There were a lot of games played, lots of conversations had, and even more learning. I think it is safe to say that everyone walked away from the weekend feeling a renewed sense of calling to the church, a deeper understanding of what it means to be a leader, and excited for the upcoming retreats.